Recently several authors reported the utility of laparoscopic ultrasonography for surgical planning during laparoscopic adrenalectomy (6-12). Critical anatomic information provided by laparoscopic ultrasonography for technical success of laparoscopic adrenalectomy includes demonstration of fat plane between the adrenal gland and the aorta, inferior vena cava, kidney, renal pedicle, pancreas, liver, and diaphragm; ruling out local invasion into adjacent organs; locoregional lymph adenopathy; exclusion of adrenal vein thrombus; and dimension of adrenal gland, extracapsular extension, or lack thereof. Intraoperative laparoscopic ultrasonography screening of the area of interest entails slow advancement- withdrawal technique coinciding with slight rotational technique. To facilitate the ultrasound examination, saline irrigation can be added to the surgical field with the patient in the head-down position. Application of Doppler function is helpful in identifying the small vessels surrounding the adrenal gland, and maybe crucial in determining the distal extent of the adrenal and/or renal vein thrombus (12). Heniford et al. suggested that intraoperative laparoscopic ultrasonography effected a change in intraoperative technique in 68% of the 18 patients undergoing laparoscopic adrenalectomy, and that venous drainage of the adrenal organ could be delineated in all cases (6). Brunt et al., reporting in their experience with 28 patients, suggested that laparoscopic ultrasonography contributed to successful completion of the procedure in 11 of 28 cases (39%) and the adrenal vein was visualized in six cases (21%) (7). Pautler et al. reported the use of laparoscopic ultrasonography during laparo-scopic partial adrenalectomy in seven patients with a hereditary multifocal pheochro-mocytoma. Intraoperative laparoscopic ultrasonography differentiated normal adrenal parenchyma from the adrenal tumor mass, facilitating laparoscopic partial adrenalec-tomy (10). 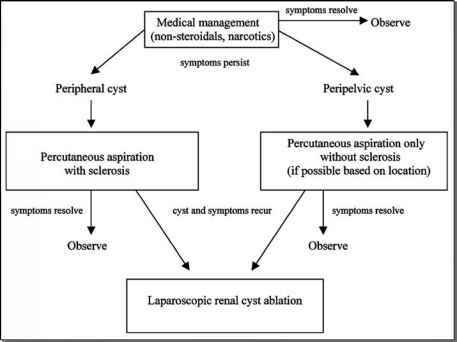 In select patients with significant concomitant intraperitoneal and retroperitoneal scarring from prior major abdominal or renal surgery, laparoscopic adrenalectomy assisted by laparoscopic ultrasonography can be performed by the transthoracic transdiaphragmatic approach (9). In addition, Hwang et al. reported that laparoscopic ultrasonography facilitated laparoscopic removal of paragangliomas in three of five cases, and not only assessed tumor margins but was also used to search for other potential retroperitoneal or adrenal masses not seen on preoperative imaging or laparoscopic inspection (12).